If you’re a .NET developer looking to move to Ruby, one of the ways you can start using Ruby straight away is with Albacore. 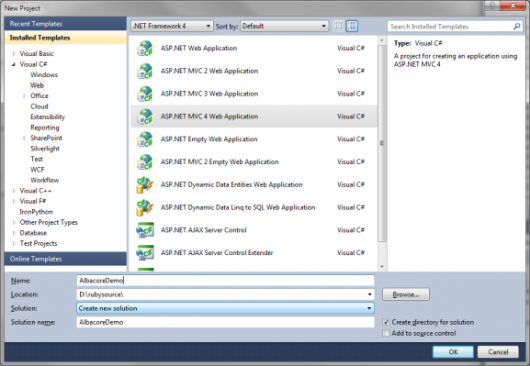 In this article, we’ll look at how you can take an existing ASP.NET web application project, add a Rakefile, and build the project using Albacore. Albacore is a set of extensions to Rake that deal specifically with building .NET-based projects. It has tasks to build, rebuild, and clean projects, run nunit, xunit, or mstest unit tests, copy files and expand templates, and generate assembly info. .NET does come with it’s own build system called MSBuild. If you’re perfectly happy using this to build your projects, then that’s fine. You probably won’t get much from the rest of this article. If you like the sound of Albacore though and think it might be for you, then read on. First though, a bit of background in case you’re not familiar with Rake (if you do know what Rake is, feel free to skip this section). Rake is Ruby Make, a Ruby build program similar to Make. It revolves around tasks, which live in a Rakefile. Once you have Albacore installed, the only other proviso is to make sure you add require 'albacore' to your Rakefile, otherwise you won’t have access to the Albacore Rake tasks. To give you an idea of how you can use Albacore, we’ll create a new project in Visual Studio, add a Rakefile, then add some tasks to handle compiling the project, running unit tests, managing AssemblyInfo.cs, and preparing the project for deployment. Create a text file called Rakefile in the root folder of your project (you can optionally give it an .rb file extension if you wish). The first line makes the Albacore tasks available to us. Next, we create a default task and set the msbuild task as a dependency. Then we define the msbuild task, which will compile our code for us, using the solution and project files already created by Visual Studio. We set the build properties to use the debug configuration, set which targets we want to call, and tell the msbuild task where to find the solution file. Note that the path to the sln file is relative to the location of the Rakefile. This calls the default task, which in turn will call the msbuild task and compile our project. You should see the test output, and everything should pass. First, we tell the task where we’re copy from, and to. Then we specify the files we want to copy using out.file, and the directories we want to copy with out.dir. Note the line out.file 'Web.Debug.config', :as => 'Web.config'. This is similar to web.config transforms, but AFAIK doesn’t actually run the transforms; it just copies the file. Depending on how reliant you are on web.config transforms, YMMV with this, and you might get better results adding the config transforms as another target in your msbuild task. Here, we set the path to the mstest executable, and set the default targets for msbuild. The corresponding lines in the msbuild and mstest tasks can be removed. Albacore is available on GitHub. The wiki has extensive documentation on all supported tasks, so is a good place to find out more info. It also contains a link to some projects using Albacore in real life, so you can see how it’s being used in production. Hopefully this has given you a taster for what you can do with Albacore, and how you could use it to start building existing .NET projects.